Another version of the 1930s gown. With this one I wanted to play with gradients, and I also changed the shading on the skirt, because I thought that the previous version looked pretty flat. 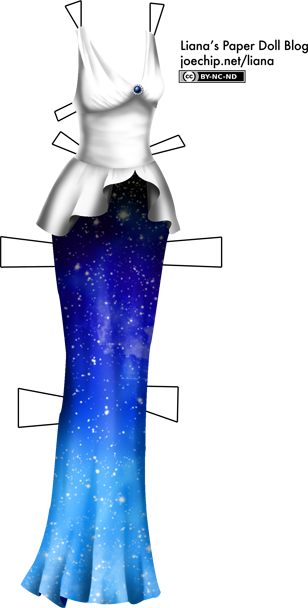 The star brush is by Obsidian Dawn. No one has guessed Milo’s favorite food yet… I’ll give you a hint, it’s white when I buy it and pink when I feed it to him. Winner gets to tell me how to color this gown, one entry per person on every new post. (So if you’ve guessed on a previous post you can guess again today, but if you haven’t guessed on a previous post you can’t go back to them and guess more than once.) Edit: Dannyscotland got it right! It’s yogurt. At least I think that’s his favorite. Dannyscotland, please post how you’d like me to color this dress! I am making various changes to the site, so have patience with me if, say, you should see it looking totally goofy because a new theme has placed all my sidebar menu items at the top of the page instead. One change I like is the ability to navigate by dress. It’s a work in progress, though. You can also now see all the dolls at one. (All four of them, sure, two of which are retired, but still it’s something.) Also, I’ve started a Twitter feed that’s just for paperdoll related things, primarily updates to my page but I might write other things there as well. It’s @lianapaperdolls. If you use Twitter, please follow me! Fruit on the bottom strawberry yogurt? Also liking this version of the dress. Yogurt it is! Dannyscotland was the first to get it (sorry Amy). What?? I guessed it??? No way! My two girls love yogurt, too. My oldest one is obsessed with the kind that comes with tiny M&Ms. Oh the dress. Ha ha, distracted thinking about my kids. I would love to see some kind of classy looking pinkish shade. I know, some people hate pink. I love it. But it could be like a fuschia-bright shade, it doesn’t have to be a super-baby-girly pink. Ohhh with a little gold or silver trim, that would be gorgeous. This was so fun! Thank you! I am so happy that you’re back. My daughter and I really enjoy following your blog. Oh, sorry; I just noticed that the prefilled form I was typing in says Kathy not Dannyscotland. I’m the same person, I promise. :-) Liana you can tell from my email.